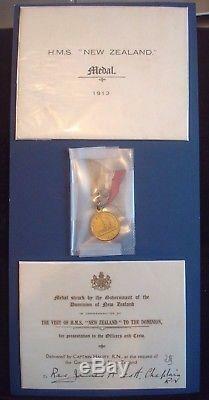 1913 HMS NEW ZEALAND MEDAL to REVEREND JAMES H SCOTT CHAPLIN R. COMES WITH ORIGINAL ENVELOPE AND INVITE TO. REVEREND JAMES H SCOTT CHAPLIN R. In 1913, upon the first visit to New Zealand by HMS. There were medallions struck to commemorate the visit. 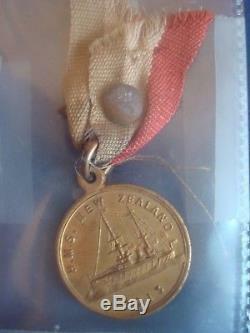 An unmounted medal that was awarded by the Citizens of Auckland to the officers and crew of HMS. During the battleships visit to Auckland 29. Size 35.5mm and struck sterling silver and issued unnamed. Obverse: A representation of HMS. With the wording To the Officers and Crew of H. Reverse: The coat of arms for the Dominion of New Zealand. These were also issued in 1913 to commemorate the visit. They were produced in gilded and plain copper versions. This was presumably for civilians as opposed to the formal medal issued to the crew. Size: 22.5mm loop suspension. 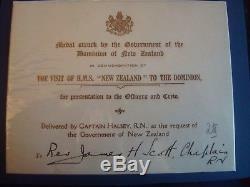 Reverse: To commemorate the visit of New Zealands gift battleship. Size 22.5mm loop suspension. 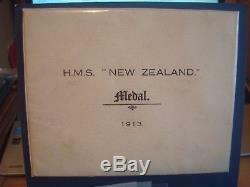 Reverse: To celebrate the visit of New Zealands gift battleship to the Empire. If item is significantly not as described then a. The item "1913 HMS NEW ZEALAND MEDAL to REVEREND JAMES H SCOTT CHAPLIN R. N" is in sale since Saturday, September 22, 2018. This item is in the category "Collectables\Militaria\World War I (1914-1918)\Medals/ Ribbons". The seller is "royalflyingcorps" and is located in Halesowen. This item can be shipped worldwide.